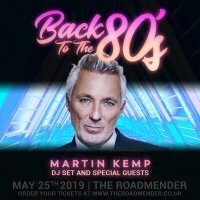 The Spandau Ballet and TV star will be taking to the decks on May 25th at the Roadmender Northampton for what looks like the 80’s party of all parties! Martin Kemp’s ‘Back to the 80’s’ DJ set is the hottest and most in demand 80’s night in the UK, currently selling out venues across the country. It’s the authentic blast from the past you’ve been waiting for! Very limited VIP tickets include Meet & Greet with Martin Kemp, a signed poster and photo opportunity.